If you want to understand your numbers, the worst thing you can do is use a spreadsheet, best- a run chart. What am I saying? Have I lost my mind? Forget for a minute what everyone says is right, and lets think about it. Lots of data arranged in columns and rows is hard to grasp. Sure, it can impress corporate overlords, throw up a smokescreen or scare the bejesus out of normal people. But, if you are interested in understanding real numbers to better manage your business, you need something better, something more in tune with reality, something that clarifies rather than hides, something that is easy to understand and do. 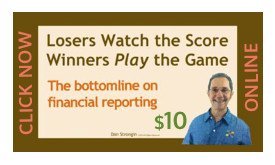 You need a report that really models what is happening. So, to find the meaning hidden in the numbers, the A number One best thing to do if you do nothing else is to plunk them into a run chart in sequence in time. There ‘aint no meaning without the context, and there 'aint no context without time. Comparing yesterday to today, or this year to last year won’t tell you much. Fixed points in time only tell you what happened in that fixed point in time. Only when seen in relation to all the other fixed points flowing forward can you see how they really relate. You need something a bit more effective than just wishin’ and hoping (so called targeted numbers), or trying to be clever: you need to see. So once you work out what data will help, keep putting it into a run chart. ​What is a Run chart? A Run chart is a simple visual model that displays data in the order they occurred; it shows how a process behaves over time. It is often known as a line chart or a line graph. To create a Run chart, you can use the commercial spreadsheet software, ouch, and a table of good data, meaning real numbers from the same process so you are comparing apples with apples, or simply create an X and Y axis and plot the data. (X is left to right, Y is up and down. X usually is the flow of time is taken and Y a rising scale. Smart run chart people don't put little circles or x's to mark the data points, as what matters is the shape of the line. Why do a run chart? What you are looking for is signals in the noise. Signals are a sign that whatever process you are looking at is under the sway of strong unpredictable influences and will be difficult to manage. I have a course at my uncorporate academy. With great patience and humor I show clearly what happens to your understanding when you look at da numbers the way I am suggesting. After taking the course you will do run charts religiously, and never look at data the same way. It only costs 10 bucks. Using it properly, I guarantee you will make so much money more than you would have, over the life of your business, you will think I am the biggest sucker in the world for selling it so cheaply. But, if you don’t take the course, you’re the one being foolish. If there is one thing you can do to improve the way you manage, it is to put the numbers that matter into run charts and use them to separate the signals from the noise. 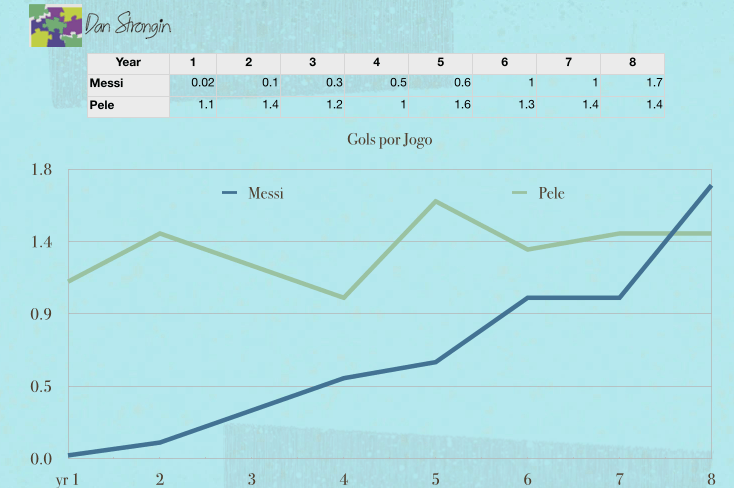 Here’s one example from the course: a table of data comparing the first 8 years of goals per game of Pele and Messi. Even if you are not aware of who they are, look at the numbers. How long does it take you to figure out who is the better? Whom do you think is better, in other words, if both were playing at the same time, whom would you choose to have on your team based strictly on these numbers, which is often all we have to go on in business? Now look at the same table with the numbers put in a run chart. Tells a very different story doesn’t it. Looking at Messi’s rise, aren’t you inclined to want to find out why? Run Charts help you to see what you need to look into because they move in the same direction as our minds, into the future. If you were to dig into it, you would find that the first four years of Messi’s career he was injured, which makes sense in the context of the data “visualized” in the run chart. I gotta tell you, read correctly, simply, they rarely miss the important things, and your managing will become incredibly more effective. Notice the quality of your understanding of the meaning hidden in the numbers, listed in rows and columns, is very different, and for many, the assumptions made from seeing the data in a table could be wrong. Only when seeing the flow of results in sequence in time, do you really “get” the meaning. So help me out here, comment below, please: Based on the data, which would you like to have on your team? Pele? Messi? both… why? What are YOU seeing here.I will respond to any and all responses! You can count on it! Better Yet: SEND ME DATA! I'll use it in a way that protects your privacy but helps us all learn. And unlock the secrets to understanding your numbers, faster, more deeply, more actionably.